I am a lucky, lucky girl. When I was approached to do a trade of live lobsters for fresh Oregon truffles, I was a bit skeptical and thinking who would want to spend the money to ship live lobsters to a complete stranger in trade for little fungal spheres but I guess this wonderful person did! So, the fun began. The big box arrived well packed and containing two beautiful live Maine lobsters. So into the pot they went. 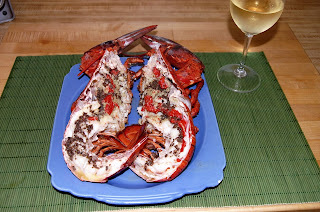 Now I love all kinds of ways to cook lobster but to me, with a treat like this, I didn't want to take anything away from the natural flavors of the lobster with the exception of some melted truffle butter I'd made using fresh black truffles. The end result was très magnifique! I of course reciprocated with a package of plenty of fresh Tuber oregonense and Leucangium carthusianum to hold up my end of the bargain. I hope my trading buddy felt as fortunate and enjoyed his prize as much as I did. Thanks Leo!